Many scientists believe the Earth was dry when it first formed, and that the building blocks for life on our planet—carbon, nitrogen and water—appeared only later as a result of collisions with other objects in our solar system that had those elements. Today, a UCLA-led team of scientists reports that it has discovered the existence of a white dwarf star whose atmosphere is rich in carbon and nitrogen, as well as in oxygen and hydrogen, the components of water. The white dwarf is approximately 200 light-years from Earth and is located in the constellation Boötes. Benjamin Zuckerman, a co-author of the research and a UCLA professor of astronomy, said the study presents evidence that the planetary system associated with the white dwarf contains materials that are the basic building blocks for life. And although the study focused on this particular star—known as WD 1425+540—the fact that its planetary system shares characteristics with our solar system strongly suggests that other planetary systems would also. The scientists report that a minor planet in the planetary system was orbiting around the white dwarf, and its trajectory was somehow altered, perhaps by the gravitational pull of a planet in the same system. That change caused the minor planet to travel very close to the white dwarf, where the star’s strong gravitational field ripped the minor planet apart into gas and dust. Those remnants went into orbit around the white dwarf—much like the rings around Saturn, Zuckerman said—before eventually spiraling onto the star itself, bringing with them the building blocks for life. “If there is water in Kuiper belt-like objects around other stars, as there now appears to be, then when rocky planets form they need not contain life’s ingredients,” said Xu, the study’s lead author. The researchers observed WD 1425+540 with the Keck Telescope in 2008 and 2014, and with the Hubble Space Telescope in 2014. They analyzed the chemical composition of its atmosphere using an instrument called a spectrometer, which breaks light into wavelengths. Spectrometers can be tuned to the wavelengths at which scientists know a given element emits and absorbs light; scientists can then determine the element’s presence by whether it emits or absorbs light of certain characteristic wavelengths. 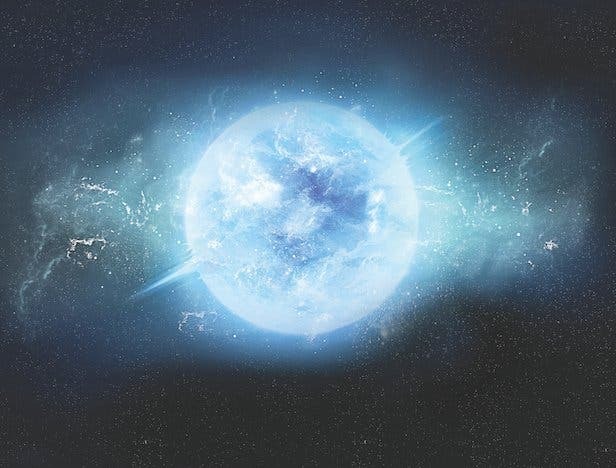 In the new study, the researchers saw the elements in the white dwarf’s atmosphere because they absorbed some of the background light from the white dwarf.